Immerse yourself in nature and connect with trees on a whole new level! ​Guided Climbs allow you to climb alongside your personal tree climbing adventure guide, as we head to the top of the tree for a memorable experience you won't soon forget. Professional and recreational tree climbers get to experience trees in a unique way. Our Guided Climbs are perfect for inexperienced climbers and novice climbers as we provide the equipment and knowledge to safely explore large, mature trees. ​Choose one of our pre-planned itineraries or customize them to fulfill your thirst for adventure. ​Whether you have a tree on your own property which you'd like to grow a deeper connection with or travel with us to various parks and campgrounds, there are many trees waiting to be explored! ​- Climb along with our Tree Climbing Adventure Guides as we take small groups into the canopy on our way to the top of the tree. Adrenaline levels rise the higher you go, yet your stress levels will decrease the more time you spend in the energy and shade of the canopy. Views and perspectives change throughout the climb; both physically and emotionally as climbers often find clarity within their minds. - Join us for a camp/climb outing at various campgrounds around Wisconsin. Hike trails with our tree and nature specialists, learn fun and useful knots, and of course, spend time in the trees. Step away from your everyday stressors and immerse yourself in the healing energy of nature. Enjoy lunch off the ground and nap in the cradling arms of magnificent trees. After admiring this 120' tall eastern white pine from the ground for many years, Mike & Jen were finally able to enjoy the view from high in its branches during a guided climb! All fees and associated costs are determined and presented prior to scheduling your event. Half-day climbing excursions last approximately 3-4 hours, and full-day excursions approximately 6-8 hours. Individuals under the influence of alcohol or drugs are not permitted to climb. 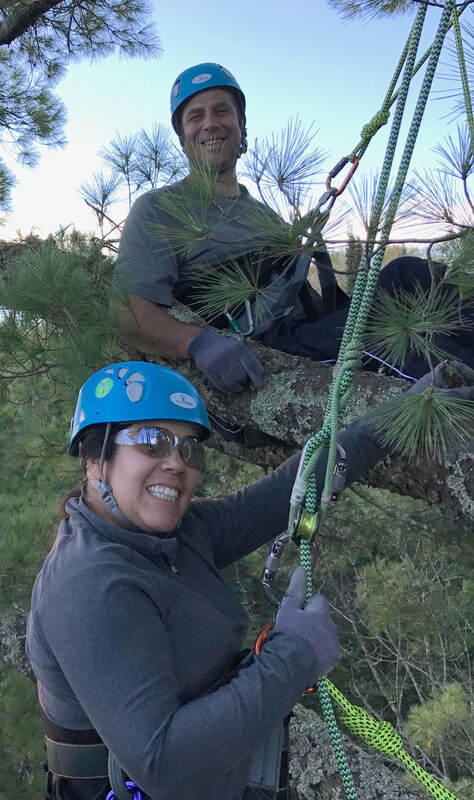 ​Treetop Explorer, LLC provides all of the equipment and gear necessary to enjoy recreational tree climbing safely. All equipment is inspected prior to each event, and double checked with each climber. ​Participants will need to be dressed in long pants and sturdy shoes. An assortment of gloves will be provided, but participants can bring their own.